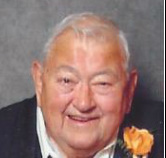 Raymond E. Engwer - Perry-Komdat Funeral Chapel, Inc.
Averill Park- Raymond R. Engwer, 88, of Rte. 43 died on Monday March 10, 2014 at the Samaritan Hospital after a brief illness. Born on his grandparent’s farm in Poestenkill, Raymond was the son of the late Rudolf and Florence Bott Engwer and husband of the late Irene Sowalskie Engwer. Ray was a lifelong resident of the Averill Park area and attended the Averill Park Schools. Ray served in the Army during WW II and he served in Europe. He was awarded a Purple Heart for injuries he received. He was a hardworking man who was self-employed in different jobs but settled into the Wholesale Greens business, under the name of Ray Engwer Wholesale Greens. He had retired in 1988 and his son’s continued on with the business.Ray was an avid golfer and was a former member of the Burden Lake Country Club. He enjoyed many years wintering in Florida. At one time Ray enjoyed snowmobiling with his family. He was a NASCAR fan, enjoyed working his garden every summer and his pool. Ray was a former member of the Sullivan-Jones VFW Post in Poestenkill. Ray was the brother of the late Henry A. Engwer and Olive Gerstel. Survivors include his children Joyce E. (late Gary) Anderson of North Greenbush, David R. (Dawn) Engwer of Averill Park, Kathleen M. Lentlie of Latham and Timothy A. (Carla) Engwer of Averill Park, his longtime companion Dorothy Vigeant and her family, his sisters Alice M. (Fred) VanderBogart and Eileen F. (Wesley) Jansson both of Averill Park, 10 grandchildren, his cherished great grandson and several nieces and nephews. Funeral Saturday 9:30 am at the Perry-Komdat Funeral Chapel 2691 NY 43 at Glass Lake Averill Park. Relatives and friends are invited and may also call at the funeral chapel on Friday 4-7 p.m.
Interment Memory Gardens, Colonie. Visit perrykomdat.com for directions and guestbook.